Brachial plexus injury can stop signals to and from the brain, preventing the muscles of the arm and hand from working properly, and causing loss of feeling in the area supplied by the injured nerve. When a nerve is cut, both the nerve and the insulation are broken. Pressure or stretching injuries can cause the fibers that carry the information to break and stop the nerve from working, without damaging the cover. Figure 1. 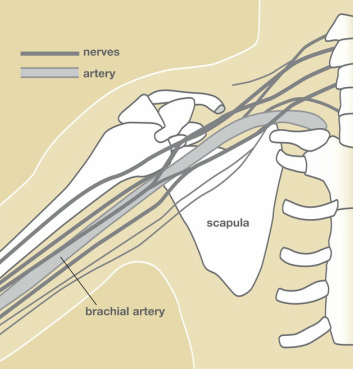 The brachial plexus is a network of nerves that originate near the neck and shoulder, whose branches form the nerves that go into the arm, forearm, and hand. Brachial plexus injurycan recover with time and therapy. The time for recovery can be weeks or months. When an injury is unlikely to improve, several surgical techniques can be used to improve the recovery. To help decide which brachial plexus injury is likely to recover, your physician will rely upon multiple examinations of the arm and hand to check the strength of muscles and sensation. Additional testing, such as an MRI scan, or CT scan/myelography, may be used to visually evaluate the brachial plexus injury. A Nerve Conduction Study/Electromyogram (NCS/EMG), a test that measures the electrical activity transmitted by nerves and muscles, may also be performed. In some cases, repair of the nerves or transfer of undamaged nerves from other areas of the body can be performed. In other cases, transfer of functioning muscles (tendon transfer) to take over areas of lost function can be performed. Factors that may affect results after brachial plexus injury include age and the type, severity, and location of the injury. Though brachial plexus injury may result in lasting problems for the patient, care by a physician and proper therapy can maximize function.